One of the biggest decisions you will face as the big day approaches is choosing the perfect wedding dress. The process of shopping for a wedding dress can be a fabulous adventure, but it can also be stressful and overwhelming--particularly because a bride-to-be often starts shopping for her gown before many other details are determined. You might have had a clear mental picture of the perfect wedding dress ever since you were five years old. On the other hand, you may have no idea what you are going to wear or feel strange about the idea of wearing white. The important thing is to relax, and remember that there are as many different kinds of dresses out there as there are different kinds of brides. When to Start Shopping for Your Wedding Dress Give yourself ample time to plan- generally the rule of thumb is that you need to order your gown at least six months before your wedding. 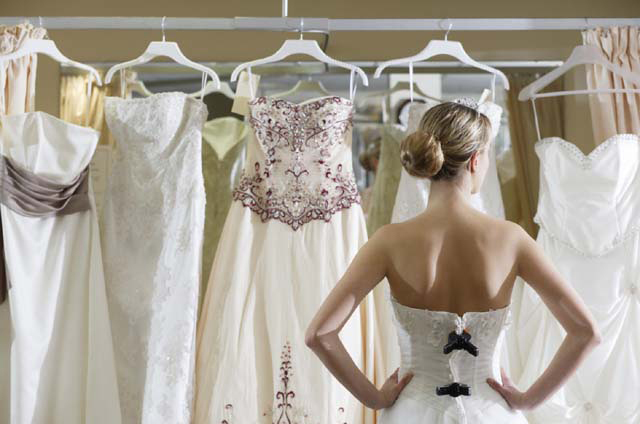 So you should ideally start shopping for your gown nine months or more before your wedding. (If you don't have this much time, it's okay, just budget for some rush charges). Plan Ahead Take a few minutes to think about what you want. It will be helpful when you enter the maze of wedding dresses out there to know what your budget is, any details that are essential (i.e. I must have a full skirt, or my arms must be covered), and an idea of how traditional you want your dress to be. After all, if really a teal pantsuit would work best for you, it's probably not worth your time to sort through racks of flouncy white gowns. Be Comfortable! On your wedding day, you'll want to look great, but you'll also want to be comfortable- it will be hard to dance and laugh (not to mention posing for all those pictures) if you're tugging your dress up or have boning jutting into your ribs. A Dress that Fits Your Body Well Think about your body type and what kinds of dresses generally look good on you. Take a look at what you regularly wear that makes you feel confident and beautiful, and then look for a wedding dress with similar lines. If a friend is making your wedding dress, ensure that you have agreed on a fitting schedule and chances to make adjustments. If you're looking for a bargain at a sample sale, or discount outlet, you should budget money for taking the dress to a good tailor. Many designers will ask for three fittings, and will closely tailor your wedding dress to fit you. Saving Money on Your Wedding Dress If money is an issue, remember that the most expensive kind of dress is not necessarily the best kind. Many brides find a bridesmaids dress in white or off-white that works perfectly, and is hundreds of dollars cheaper. There are thousands of dresses to be had at sample sales, thrift stores, and ebay. Consider taking pictures from magazines to a friend who sews or seamstress and getting a price quote. If you choose to make your own dress, don't delay. The sooner you finish it, the sooner you'll be able to attend to the many other details of your wedding. Most of all, remember this is your wedding day. Wear whatever makes you comfortable and feels like you. And have fun shopping for your wedding dress. It should be a once-in-a-lifetime opportunity. Now you're ready to start checking out wedding dresses on the web!